River Landing - Saskatchewan's premier residential and destination tourist centre! The new River Landing Parkade is located underneath the Remai Modern Art Gallery of Saskatchewan and is open for public paid parking, 6 a.m. - 1:00 a.m., seven days a week. Welcome to River Landing--Saskatchewan's premier destination centre! Over 36 acres of beautiful riverfront park, pathways, amenities, residential development, farmers' market, restaurants, and special events--all waiting for you to enjoy. River Landing Phase I has reclaimed the riverfront with the development of an exciting park, the Remai Modern, the Remai Arts Centre, Pavilion Building, and the “Prairie Wind” landmark. The River Landing Phase II redevelopment project is designed to enhance the sustainability of downtown by reclaiming and developing the A.L. Cole "brownfield" and surrounding area - literally the front yard of Saskatoon’s downtown. Visit the ever-vibrant Saskatoon Farmers’ Market and Ideas Inc. or work out at the outdoor adult fitness circuit. 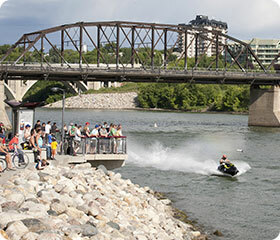 The development of River Landing presents an exciting social, cultural and commercial focus in one of Canada’s fastest growing communities - a showcase and lasting legacy for the citizens of Saskatoon, the people of Saskatchewan, and proud Canadians.